Abu Dhabi: Sushma Swaraj, External Affairs Minister of India, arrived in Abu Dhabi late on Monday for a two-day official visit. 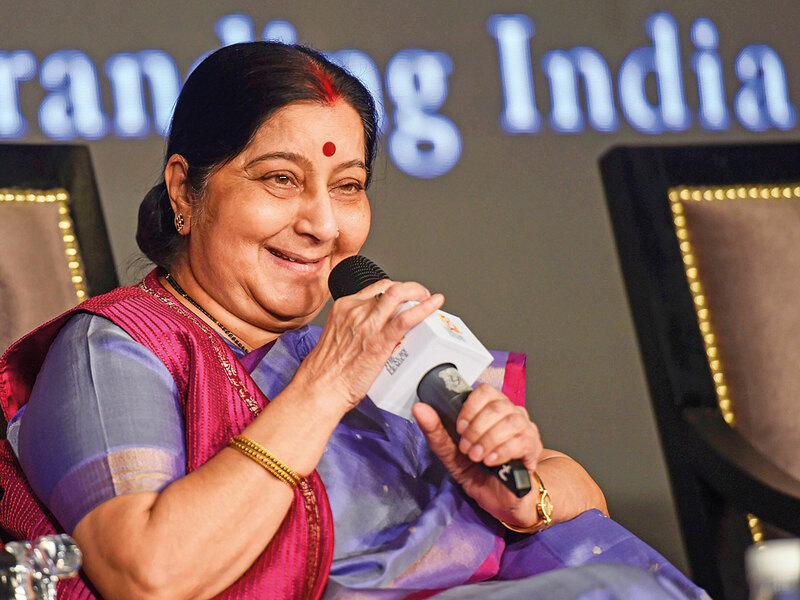 She is leading a delegation of senior officials to the UAE to co-chair the 12th session of the India-UAE Joint Commission Meeting for Economic and Technical Cooperation with Shaikh Abdullah Bin Zayed Al Nahyan, Minister of Foreign Affairs and International Cooperation, according to a press release issued by the Indian Embassy in Abu Dhabi. Shaikh Abdullah and Swaraj will inaugurate the Gandhi-Zayed Digital Museum to commemorate the 100th birth anniversary of Shaikh Zayed Bin Sultan Al Nahyan and 150th birth anniversary of Mahatma Gandhi. Noora Al Ka’abi, Minister of Culture and Knowledge Development, will also be present at the inaugural ceremony at Manarat Al Saadiyat in Abu Dhabi on Tuesday afternoon, according to official sources. Shaikh Abdullah and Swaraj had announced the museum, a first-of-its-kind UAE-India exhibition aligning with the ‘Year of Zayed’ programmes, during Shaikh Abdullah’s India visit in June. The museum’s interactive digital content will showcase rare photos, videos and objects representing the life, works and philosophies of both renowned leaders using cutting-edge technologies. It will also reaffirm the historical ties and shared values of peace, tolerance and sustainability between the UAE and India. The embassy press release highlighted strong bonds of India-UAE friendship, which are founded on millennia-old cultural, religious and economic interaction between the two regions. In the recent past, with the exchange of visits at the highest level, the relationship has been elevated to a Comprehensive Strategic Partnership. With nearly $50 billion (Dh183.5 billion) bilateral trade, the two countries are one of the largest trade partners for each other and have made robust investments bilaterally. The UAE is the sixth-largest source of India’s oil imports and hosts a 3.3 million-strong Indian community, sad the press release.